I bought a new espresso machine with the main intention to hack it and modify various parts while enjoying really good coffee along the way. 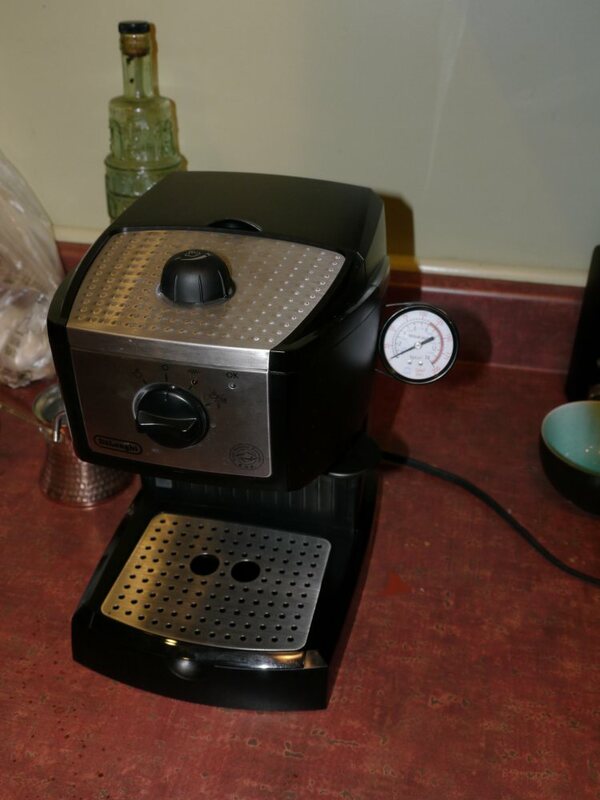 This machine is a DeLonghi EC155 and cost $90 at Fry's Electronics with $20 mail-in-rebate. I normally don't buy anything that includes a rebate, but I made an exception in this case since $90 is already a good price for this machine. 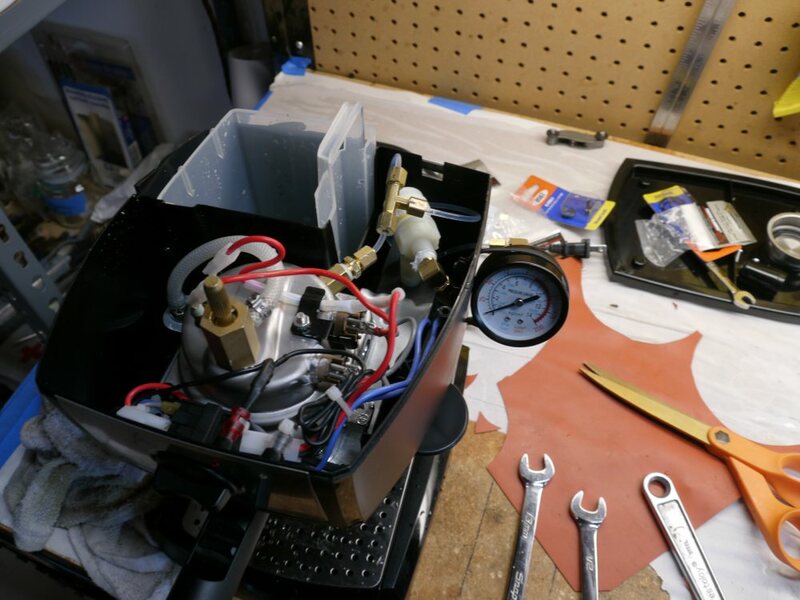 The EC155 has a stainless steel boiler, "15-bar" pump, large water reservoir, separate baskets for single and double shots, and a pressurized portafilter. Espresso purists will tell you that a pressurized portafilter is just a kludge that is meant to help newbies get the right extraction time despite improper grind size or tamping, but I might disagree -- more on that later. In any case, this machine is a really great value, and a HUGE upgrade from steam-powered machines. 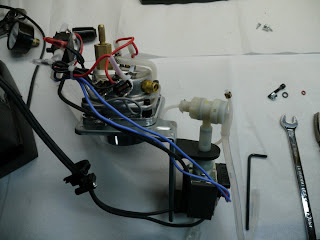 I previously hacked a steam-powered machine and added an air pump and temperature regulator to have more control over the brew process: http://benkrasnow.blogspot.com/2009/12/using-my-hacked-espresso-machine.html. 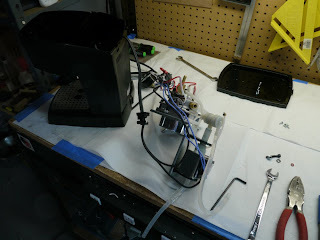 The machine worked pretty well, but it was time to retire it because of a few nagging problems including a leaky portafilter, overall junky basket design, and other very difficult-to-fix items. The DeLonghi EC155 with added pressure gauge. I could not believe the unit would ever reach its stated "15-bar" pressure, and I was also curious what the brew pressure really was for an average shot. I started by removing all of the machine's guts from the case. It's built surprisingly well. 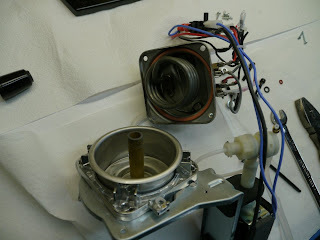 The grouphead is made of very thick cast metal (probably an aluminum alloy), and the boiler is all-stainless with brass fittings and silicone seals. The pump is a ULKA brand pump. There is no obvious model number, though. The boiler contains a large heating element and two separate thermal switches -- one for espresso, the other for steam generation. The boiler empties into the grouphead via the brass tube sticking up through the boiler's bottom. This way, the water level must rise above the brass tube's top for water to enter the grouphead. When the machine is off, there is no chance of water leaking out. The brass tube also contains a spring-loaded valve that keeps the grouphead closed until the pressure in the boiler reaches 75 psi (5 bar). I suspect this is to prevent the grouphead from leaking while using the steam wand. I removed the original 4mm plastic tube that ran from the pressure regulator to the boiler and replaced it with 1/8" PFA tubing. 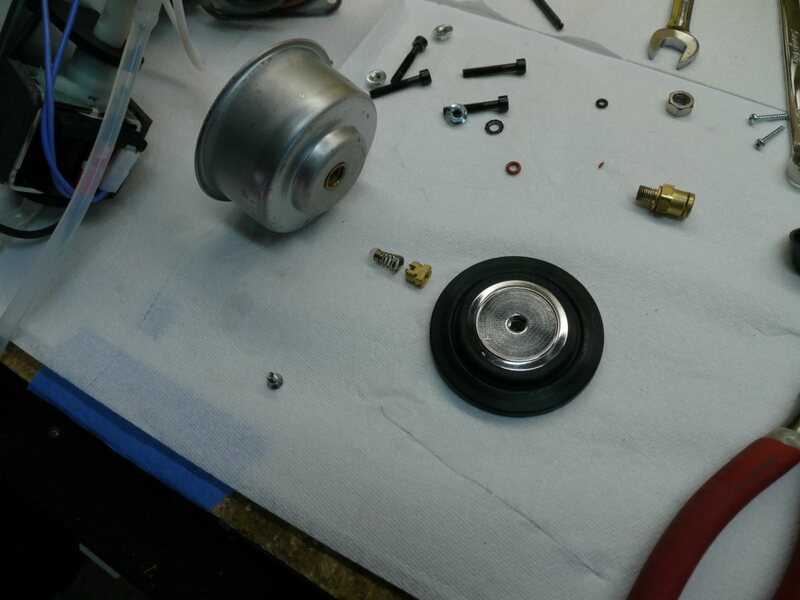 I added a tee in the line and attached the pressure gauge with more pipe fittings and 1/8" compression adapter. The machine will reach 13 bar when the portafilter is completely blocked (no flow), but is usually 7-8 bar during a double shot. 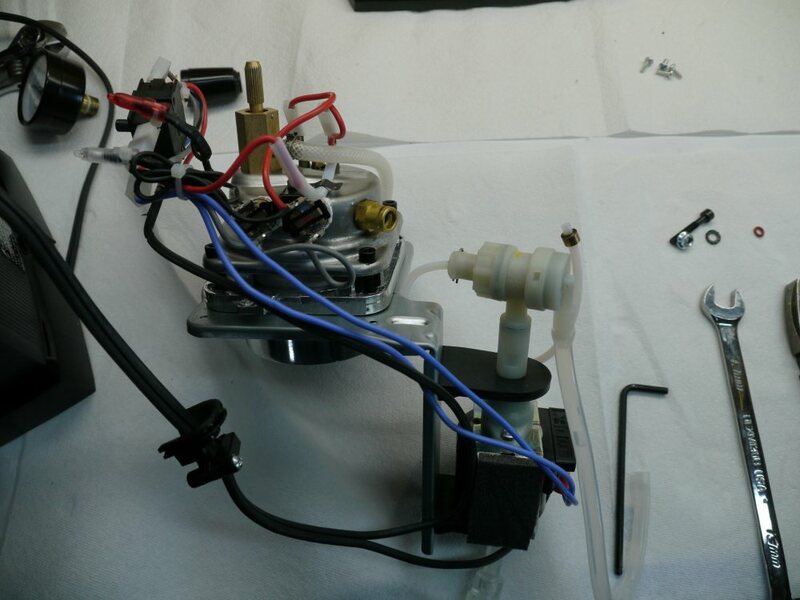 Thus, the pressure regulator doesn't do anything in normal operation since the pump cannot maintain more than 8 bar during an average brew flow rate. I may be hacking this part in the future to have more control over brew pressure. However, I think the espresso experts agree that the brew process should have constant flow, not constant pressure. I am guessing that the pump is specifically sized so that the brew pressure will be about 7.5 bar and a double shot will take exactly 25 seconds. I rotated each ring 45* with respect to the ring below it. 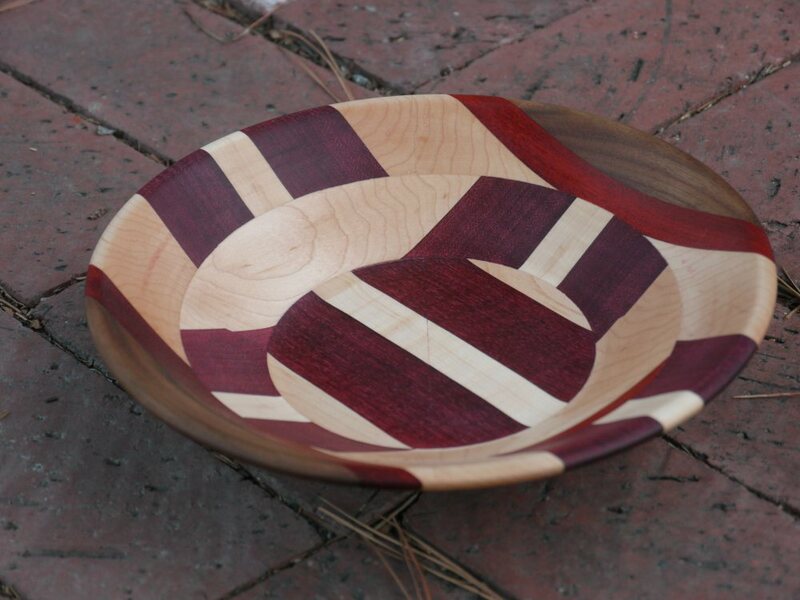 This is good since the ring seams do not line up, and the bowl has a more wild, interesting pattern. I am not good at turning feet on bowls, since I do not have a very good chucking system on my lathe, and don't get much practice with turning feet. 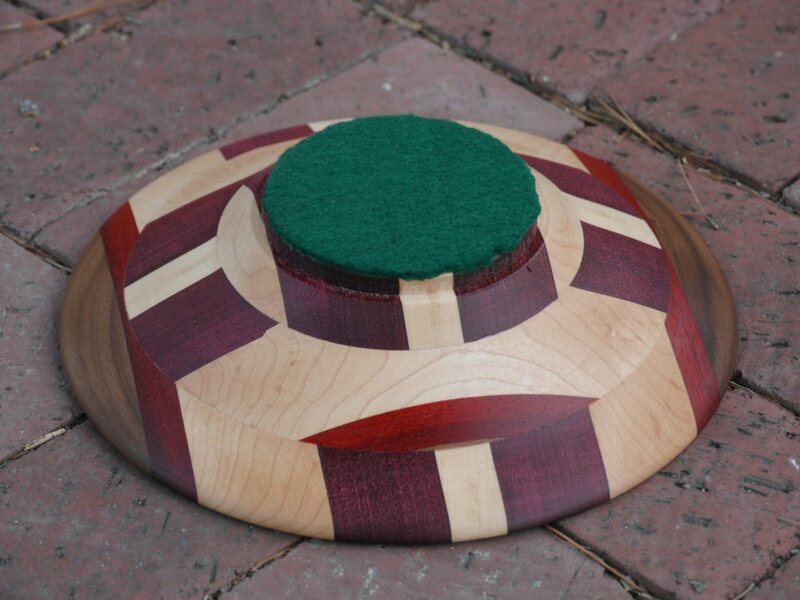 Instead, once I cut the bowl off the lathe (or remove it from the drive plate), I just sand the bottom flat, and add some felt to cover the surface. 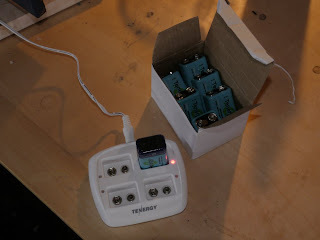 I recently bought some 250mAh 9V NiMH batteries and a charger made by Tenergy. I plan to use these batteries in a Shure PG58 wireless mic. 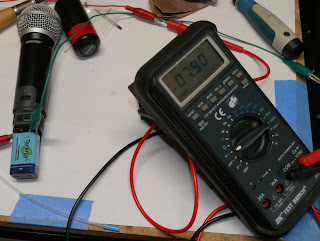 I first tested the current draw by the mic from a bench power supply, and found that is was very close to 50mA from 6.5V to 10V input voltage, and did not fluctuate based on sound input to the microphone. 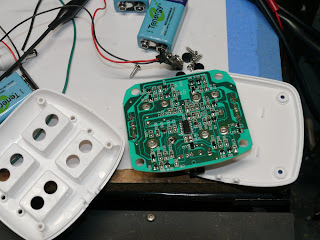 I connected a DMM in parallel with the battery that is plugged directly into the microphone. Test 2 = battery charged for two days (fast charge, then automatic trickle), removed from charger and immediately tested in microphone. 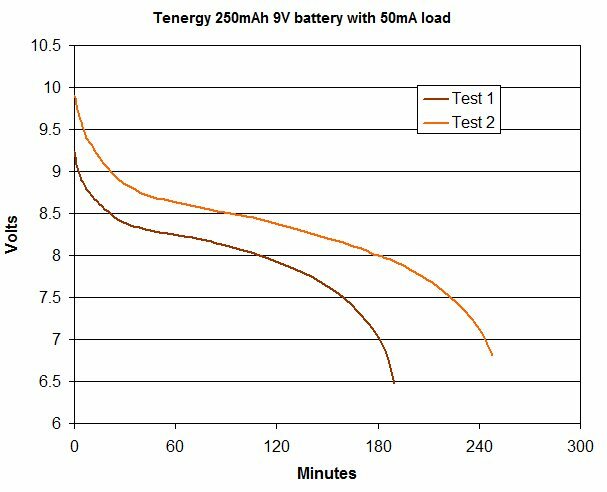 I am slightly disappointed since the battery is supposed to be 250mAh, and I am only discharging it at 50mA ( .2C), so I should get nearly full capacity, but instead only get 200mAh effective capacity when the battery is fresh out of the charger -- 150mAh capacity after a couple days . It will probably be good enough for my application, but this is more evidence that battery manufacturers are inflating their ratings. I popped open the charger and found a circuit board with a single IC (part number is obfuscated -- possibly not intentionally), lots of SMD transistors and assorted passives. 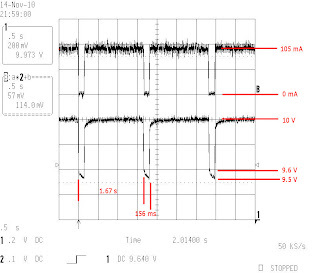 Here's an oscilloscope screenshot that shows the charging current and voltage behavior. This battery is almost completely discharged. The charger maintains a constant current of 105mA, with a 167ms gap every 1.7 s where no current is put into the battery. Presumably, this is so the charger can monitor the unloaded battery voltage. 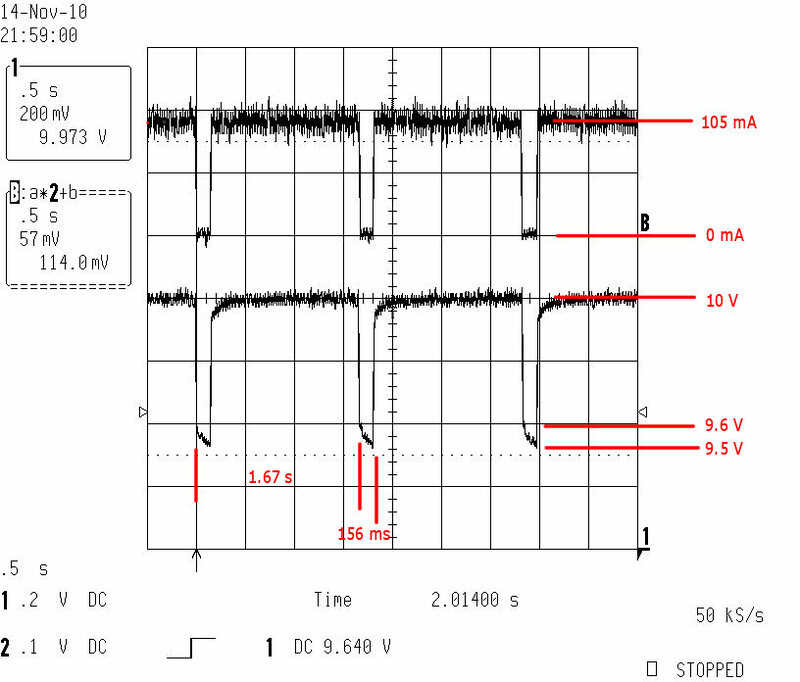 As you can see, the battery voltage drops from 9.6V to 9.5V in the 167ms gap. 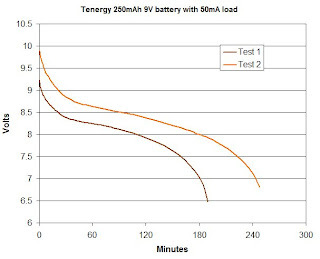 As the battery charges, the charge voltage (10 V in this screenshot) rises to accommodate the battery's increasing state of charge.